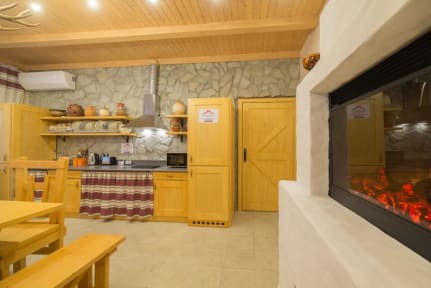 Hostel Izba interior is decorated in traditional Russian style and is made exclusively from natural environmental materials. The furnace, a samovar, a wall of log wood, wood furniture recreate the atmosphere of this cottage. Our company has long established itself in the market of hotel services, thus creating a new hostel, we took into account all your wishes! Hostel is situated in the heart of Vladivostok. It is close to shopping center, 24/7 supermarket, bus stop, promenade, area, many cafes and restaurants. The common rooms, each bed is equipped with an orthopedic mattress, individual lighting and socket, shutters will provide you personal space, has a personal locker. We also offer our guests comfortable double rooms. 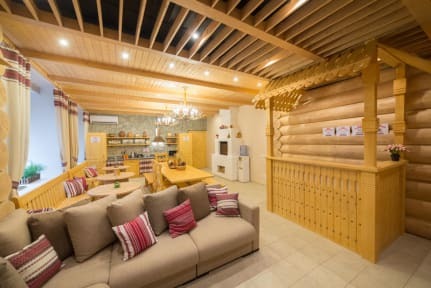 They are decorated in Russian style, very cozy and home-like warm. They have the necessary toiletries, slippers and many other things that need to guests regardless of the duration of their visit. We value each guest and try to do everything to make you want to come back to us again. For your comfort, we regularly use the laundry service that does not hurt you to enjoy your vacation on the white bed linen. Friendly staff, maximum comfort, always quiet, the clock is working Wi-Fi. Payment upon arrival by cash, credit cards. This proeprty may pre-authorise your credit card.